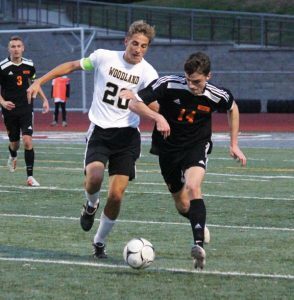 NAUGATUCK — The Woodland boys soccer team found success all season by locking down opponents with stifling defense. In last Thursday’s Naugatuck Valley League tournament championship against Watertown, suffocating defense kept the Hawks away from hardware. 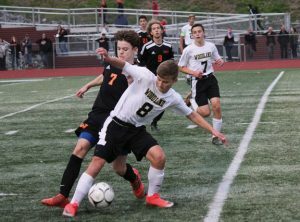 The unbeaten Indians held Woodland to only seven shots on goal en route to a 2-0 victory before an estimated 500 fans at Naugatuck’s Veterans Field. The Hawks’ best scoring chance came at the midway point of the first half, when Ethan Carlone clanged a shot off the left goalpost. After that, Watertown goalie Hayden Beauty stood tall and finished with seven saves. Watertown’s Troy Tedesco netted the game-winning goal with 10:48 to play in the first half when he cleaned up a mess in the box and fired a shot that deflected off Woodland goalie Ryan Lamb and into the net. Woodland (13-3-3) applied plenty of pressure over the final 20 minutes, especially from efforts of players such as Jason Claiborn, but the Hawks couldn’t find the back of the net. Watertown’s second goal was an own goal with 9:09 to play after Cole Barrows passed back to Lamb, who made an error as he attempted to clear the ball. It was his only mistake in an otherwise outstanding effort that kept Woodland in the game all night. 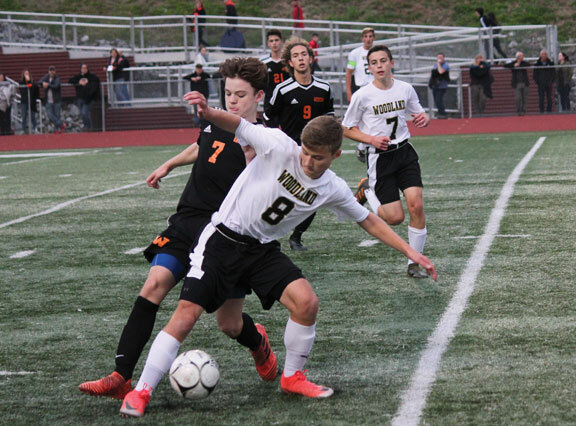 Even after the own goal, Woodland pushed offensively but failed to crack Watertown’s defense. The Indians became the first team aside from Naugatuck to win an NVL title since 2012. The Hawks ended Naugy’s five-year stranglehold on the league title by eliminating the Greyhounds in the semifinals on Oct. 30. Maciej Lewicki netted both of Woodland’s goals in a 2-0 victory. The Hawks earned the No. 9 seed in the Class M state tournament and will to host No. 24 Aerospace in the first round on Tuesday. The second round is set for Thursday, and quarterfinals will be played Saturday.